I contacted Vodacom insurance for assistance. Consultant referred me to a local repair centre nearest to my residence. This morning (29 March 2016 @ 10am) I visited the Westgate Vodacom Branch. I stood around for a minute or so with no consultant ready to assist. I approached a consultant sitting at his desk busy on his cellphone and asked for assistance to which he replied with no greeting at all "what do you need assistance with". I replied that I need assistance with repairs to my iPhone for which I do have insurance. Consultant disappeared for a couple of minutes and upon his return said that no body can help me, sorry. The consultant who is able to help with a repair claim is on leave today. Honestly, is there only one person per branch who can assist with a claim? 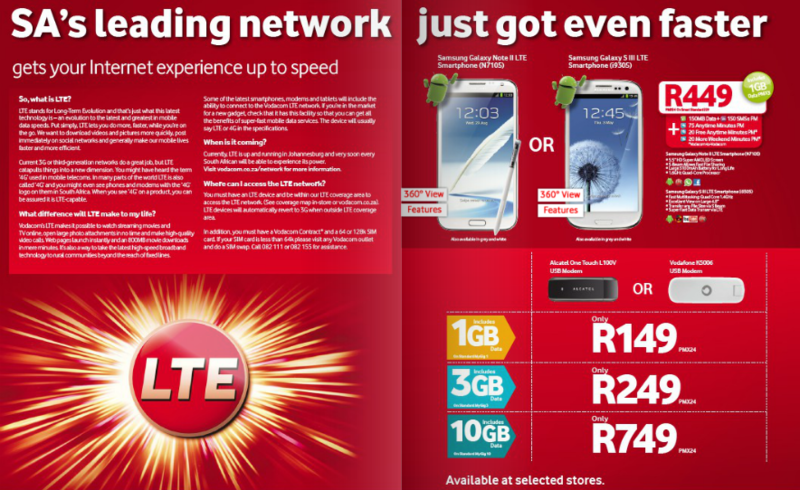 Vodacom, one of the largest telecommunication providers! Come on. I know that Vodacom has grown into this huge JSE listed company, but remember, it is us, your customers who got you there. Purchased a laptop deal hp 15 Celeron which comes with a 1G k4203 dongle which was delivered on Tuesday. This "special" is advertised nationwide on in store leaflet(brochure) as well as online. The hp laptop comes standard with windows 10 already installed. 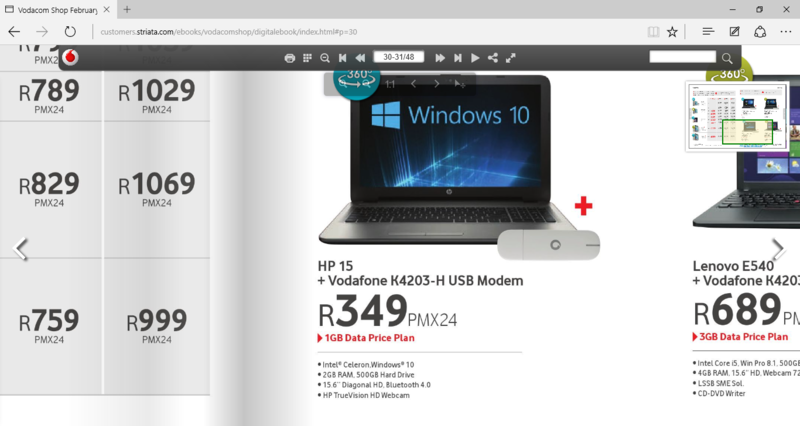 However I discovered (and this was verified by various Vodacom agents) that the dongle is NOT compatible with windows 10. After insisting for two days of how this will be rectified, I was told that ram couriers would collect from between 7-21 working days, and that this deal is cancelled with immediate effect. Once the laptop is collected I can re apply for a new deal. This does not sit well with me for the following reasons. I have spent days setting up the laptop with personal information and personalisation. Work was done on the laptop as I use it for homework after work. The 7-21 working days collection policy (as stated in contract) only applies for faulty devives howver this is INCORRECT and FALSE advertising and negligent on behalf of Vodacom. I would like a general manager to contact me asap to rectify this immediately or I will be forced to go public with this matter. The service I received from Vodacom even after speaking with management from Vodacom online is pathetic! I have a complaint about my Vodacom Power Tab 10. On Saturday the 27th February 2016 I went to Vodacom store in Scottburgh. I applied for a Vodacom Power Tab 10 for my daughter. They had no stock. On Monday got a call stock arrived. On Tuesday 1st March I went to store to collect. My daughter took some photos and videos, tried to send a sms. She was not allowed to play with it as it was a school night. She plugged it in to charge. We notice it was not charging. I then tried again on Wednesday to charge, thought maybe it was her plug. Not charging I eventually got it to charge it took the whole day to go from 12% to 24%. I went to the store today 3rd March 2016, My Consultant Nazeera was busy with another person, I patiently waited. While she was busy I spoke to the other consultant, he then told Nazeera the problem. She took the tab and put it in front of her to see if it is charging while helping her client in front of her, she was leaning over the tab while assisting the other client. When I gave it to her I had the sponge that protected the screen from the Bluetooth keypad, she removed the white sponge thing and carried on with her other client. Still waiting patiently. After they confirmed it is def. not charging. When I received it on Tuesday 1st March with my contract 3 pages it was explained that I can bring it back if there was a problem with the device, (I did not receive a booklet regarding the warranty) and so I did bring it to the stone. I wanted a new tabled (as it is faulty and not charging) they said no, it needs to go in for repairs and evaluation and will take a week to do so. I do not want a repaired tabled I need a new. When I asked for that she said she will call the manager. I explained according to CPA that I got the right to have a new tab. (I as a consumer got the right to choose to receive a new device or send in for repair or cancel and get my money back. He then insulted me and said if I know so much why don't I just do want I want. This is no way to speak to a client. Absolutely unacceptable. Because I started being upset the way he was treating me he started searching for errors on the screen and then pointed out a small scratch on the screen. He said he need to report that and that might be a reason why they will not give me a new tablet. We been extremely careful with the tabled as I said before the device was not charging so we had no time to actually have time spend with the tabled, it still had the white sponge protector when I handed it inn it had no scratches so it must have been while Nazeera was dealing with her client she must have scratched it as she was annoyed with me. I have never been treated the way I have been treated by Vodacom the last couple of days.I was so deeply upset the way they were treating me I left with the device again) I actually feel like canceling this contact and would like all money refunded to me. I will go somewhere else with better service. On Tuesday when I collected my daughters tabled I also had my husband with me to do his upgrade. We changed our mind regarding the upgrade and while she was on the phone to do upgrade she said in a tone that customer have. Since when do we as clients gets treated like this? Then on Wednesday I was on the line with Vodacom regarding our Wi-Fi device that I got a sms that we have little data left so I phone to find out why as the start of the month just started and we have a 2G data contract and it is impossible to have used that in 1 day. And also wanted to discuss his upgrade, we then got transferred to another department as his contact is on the new system. I was on the line for 1hour 17min. Just to get cut off at that stage. Nothing been sorted. I changed my package on Saturday 27th February to higher package. I then said that I noticed on my contact that I have BIS on my new Blackberry and was very annoyed that Vodacom did not delete this service when I received my new blackberry and you cannot use BIS on the new devices. I would like a refund on all of this. Before all this I would have just left it but I am so disappointed in Vodacom that I now would like this refunded to me. Someone called suggesting the upgrade of my 3G and I agree to that. To my surprise I received 3 X 3G modems which I returned immediately. I have been on Vodacom but could get any assistance. The tracker no for the parcel was V2P0033316 and the parcel was received by Craig. I request for the immediate cancellation of these deductions. This inconvenience me a lot. I will never again have deal with your company. I will cancel all my contracts as soon as they due for renewal. On the 3-11-15 I received an account from Vodacom for roaming in Canada R642.88, UK R708.08 and USA R235.93. At no stage did I make or receive any calls. I was told that it would take 2 days at the longest for someone to get back to me and I have called many times and spoken to Thalitha Madiba, Sindiswa Butelesi, Zawele Mabena, Sipho Dhlamini etc. in the customer service dept., and today 3 months later I have still not received any calls from Vodacom regarding this issue, only SMS's telling me to pay or the service will be disconnected. Reference number is S3-9O26C-CWJN. Hope that this matter will receive your urgent attention. I bought a vodacom tablet in April 2015. The tablet was constantly overheating to a point where it was too hot to even pick up since day one. I took it back to the store within the 7 day exchange period and i was told that its normal and that they wouldn't exchange it. 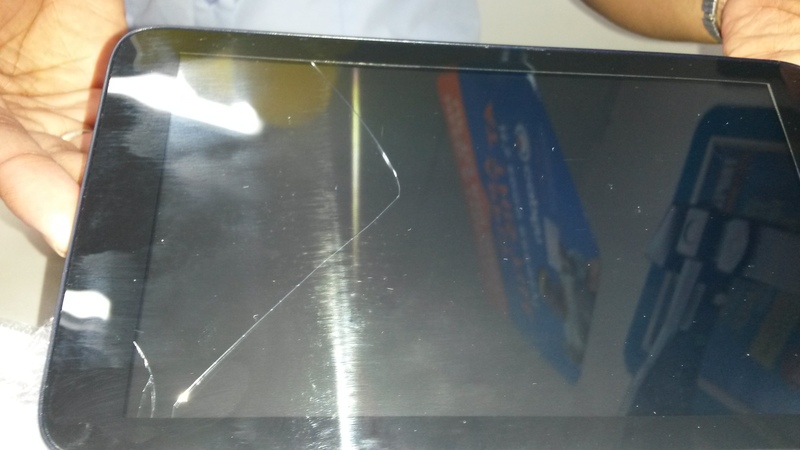 I kept on using the tablet until one morning while charging as i picked up the tablet the screen cracked in right hand bottom corner. 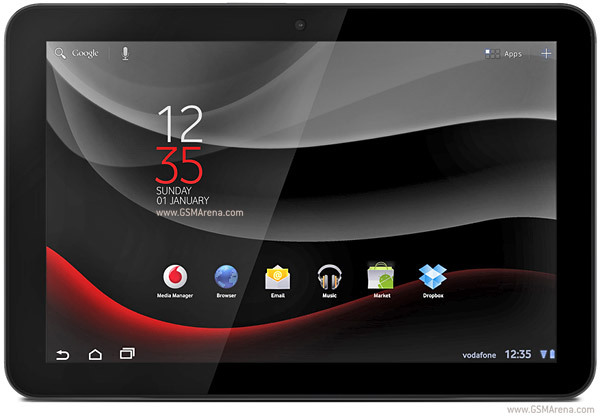 I took the tablet in and i dealt with a vodacom technician named Basil who explained that there is a technical fault with the tablet and he then contacted someone at vodacom head office who advises me to take in the box with all accessories and tablet to the store where i bought it and that i will be contacted as to when i will be receiving my new tablet. In September 2015 I went to Vodacom Heidelberg Gauteng at their shop situated in the new mall. I asked the lady to cancel all unnecessary extras on my bill so that it gets to R1000 and then blocks. I would then like the option to load airtime myself. She promised me that will be done and that Vodacom will phone me to finalize everything. This didn't happen and I went bank in October where after she told me she will try again. In late October 2015 I started at a new Company Alpla and the contract was transferred to Alpla. Again we picked up that the account was still open and that a lot of extras weren't canceled. The Vodacom Rep. for Alpla then promised it will be done. Today I had to pay in excess R4500 for bills exceeding R1000 for the months of Oct , Nov and December 2015. This is exceptional bad service and I am now at a point to take this much further to the Consumer council and more. I expect Vodacom to re-fund me the R4500 . I have been a loyal Customer of Vodacom for more than 10 years. So I noticed when I checked my balance that my my balances for February is showing and I roamed a bit and made some phone calls. I checked again later and saw that instead of January balances reducing they take from the February data and airtime. I phoned the customer service and the guy confirmed that is how it works with Vodacom. I'm gonna lose my R600 + airtime and almost a gig of data because "that's how it works with Vodacom " Anyone experiencing this corrupt practice with advice. On or about the 14th December I phoned Vodacom for a Data Bundle (R216Z Router and 2GB LTE Data). I am currently for about 20 (twenty) years a contract customer with Vodacom. After all the approvals and many minutes on the phone, I was informed via sms that they do not have stock and will contact me when stock is available. I received an sms around 24th December that they will deliver the following week. I then phoned 082-1945 and asked them if they can deliver from the 11th January as I am not at home and on holiday. I was informed that it is not possible and that they will then cancel the deal. I then went to Vodashop in Cresta on the 26 or 27th of December and explained that I am away from the 28th of December and if they can help me with above Data bundle. They could actually help me and have stock, but Vodacom have still not cancelled the previous deal. I then decided to wait till I am back from my holiday. Today the 12th January I walked into Vodashop Cresta and asked if we can do the deal today. Unbelievably the deal is still not cancelled, I still have not received anything and I still cannot receive anything from Cresta. I just wonder how pathetic Vodacom can actually be!! I cannot talk to anybody or try to sort the mess out!! I ask Vodacom four months ago to send my statement by email according to the Vodacom worker that she change it and will be done. This is now the 4th time that I must struggle to get my statement on time. I want a letter from Vodacom to confirm that the statement will be send by email on time. After 30 plus years the Vodacom service are turning in a circus. to much advertising messages while waiting to be help on your customer services lines. Very irritating -- I want to be serve with the problem I am phoning for. Not buying exstra things I do not need or can not afford. My account was debited twice on 31 dec 2015. I called several times for a refund as I have other debit orders running. I was promised a fault is logged and a sms confirmed money will be refunded. My debit orders was returned and my money was rather credited to the Vodacom account. I am very disappointed and unsatisfied that I have to beg Vodacom for my own money and the inconvenience it is causing as I have rd's on my account. I need the money back into my asap and as I have called Vodacom again today for it to be refunded today still. Just tell me if Vodacom know they made a mistake why must I as a paying customer pay for your mistakes and do continuos follow ups. I'm not in areas and what you are doing is unlawful to take extra money from account without my consent. I have been billed TWICE for the month of December 2015 and this was a great cause of anxiety. Received an sms from Vodacom stating they have made an error. How did that happen. Its a very callous thing to do. Also during December the network esp.for internet and browsing was absolutely pathetic. Vodacom Account number:I3030851-7. Have a contract with active debit order with Vodacom since 1998. Travel a lot, have roaming and never had problems .Vodacom also never had a problem once to get paid. Travel abroad on 22 Dec 2015, could use my phone for two days, thereafter no service. Back in the country on 3 Jan 2016, found out that my account has been suspended. After a nightmare of getting someone to query this with, I was told that my account has been suspended because of non payment. Vodacom did not submit the debit order because the 1st Jan was a holiday. They could still not explain why my services were suspended since 23 December 2015.
Who authorized the deactivation of my roaming and why do I have to be punished for Vodacom's incompetency? Today I spoke to Zuki at Customer service, one helpful person in the desert of Vodacom's customer service department. Found out that someone in back office block my phone, because he has decided that I use my phone too much! I made about four calls, had an emergency I will keep on sending complaints out in cyber space until someone from Vodacom can answer my queries. Vodacom, please step up and take ownership of your bad service in order to avoid the same problem in future. I applied for a mortgage bond and was advised that I am in arrears with my Vodacom account. I called the customer care line on 4th January 2016 to get details of arrears as the only account I have with Vodacom I cancelled around March 2015. the call center agent advised that the account has been handed over to BBM attorneys , I called BBM attorney and they advised that they cannot pick up my account on their system. I then called the customer care department again and they advised that they would resolve and revert back to me. I called the customer care line again on the 5th January 2016 and advised that I need to understand why I have arrears account and I need a letter detailing the information with the amount outstanding and banking details. The customer care department advised that I must wait for BBM to get back to me around the 15th January 2016. I asked that the consultant send me a letter confirming that I am trying to resolve this issue so I can submit to my financial institution and proceed with my mortgage bond application, the consultant advised that they cannot assist and I must wait until the 15th. I find this unacceptable that Vodacom process design cannot accommodate my request and is putting my entire bond application at risk for an account which I had cancelled. All I am asking is the details the amount and where I can make payment . I have been with Vodacom for over 11years, of late they are not helpful at all. I've contacted them to change my debit order date due to me starting at a new company and my salary date has changed - the lady informed me that they will sent me the forms to complete - I have still not to today received any forms from Vodacom. so with that issue my debit order has been an issue for the past two months!!! after upgrading in October I phoned in again as I received an sms saying that there was a problem with my account again - I was then informed that Vodacom billed me twice for insurance for a product that I gave no authorization for. The lady in the accounts department change my debit order over the phone when I asked her to - why couldn't that have been done in the first place when I phoned? No they wont re-activate my line for 3 working days even though the debit order went off on the correct date? I don't understand how the 'leading mobile provider" is not helping their clients that have been with them over a decade? I have been a customer with Vodacom for over 4 years. I was now due for an upgrade on 1 October 2015. When I wanted to do the actual upgrade, I contacted the Vodacom Key West branch to assist me. The person that was assisting me informed me that I had a P400 portfolio and I needed a P600 portfolio in order to upgrade. When I asked what it meant, he said that there is 2 ITC listings on my name and that is the reason why Vodacom cannot upgrade me. I then argued to say that I know that I do not have any listings on my name, he said I can then contact TransUnion to get my report and email it through to them, he can then motivate to say that the information regarding my profile on Vodacom's system is incorrect. I contacted TransUnion and had to wait 10 working days to get my report, when I received the report, I immediately sent it to Vodacom. The report was completely clear with no defaults, judgements, notarial bonds or trace alerts on my name. I then waited another 2 days for Vodacom to just get back to me, so I had to phone them to request feedback. Then he said that the ITC report does not suffice and I must contact Experian as well, since there is negative results on my name from Experian as well. I then went back to the drawing board and requested my Experian check as well, which also came back negative with no defaults, judgements, notarial bonds or trace alerts on my name. I also pulled a RefCheck report on my name which has ITC, Experian as well as XDS results on, which is all negative and completely clear of any listings. After another wait of 3 days, he came back to me to say that Vodacom won't be able to assist me at all. I then contacted the Vodacom upgrades department to see if they can assist, they were more pathetic than the branch! I dealt with one of the agents called Chantell, who said she will assist me and requested that I send through all the reports with the negative results, which I did. She then never came back to me and I had to contact her again, I left 2 messages for her, as she was not available, upon which she never returned my calls. I then escalated it to her Manager, Charlene who kept on putting me on hold and eventually put Chantell back on the phone. Charlene did not once try and resolve my query or assist in escalating it to the correct person. Chantell then eventually said they cannot assist me, I asked to then speak to Charlene's boss's boss's boss, Chantell could not even tell me who that person is, how does Vodacom's employees NOT KNOW who they are working for? If this is what the customer service with Vodacom is, I am absolutely HORRIFIED !!!! I am not a customer trying to do a new application, I am an existing customer trying to keep giving Vodacom business, which they are obviously not interested in. The call centre is actually PATHETIC to say the least and the branch isn't much better. I demand that someone from Vodacom contact me immediately and make sure that I can upgrade. There is no actual valid reason why this is being declined, as I have 3 reports to show that my name is clear. The lack of responsibility and 'passing the buck' with Vodacom is SHOCKING and HORRENDOUS, I can actually not believe how these people are still in business. My parents bought me a contract cellphone and I feel as if I'm supporting a network that doesn't really care about me. First of all its very irritating that every time I want to change something on my phone I always have to ask my parent's permission it's ridiculous. Yes she is the account holder but she bought me this cellphone therefore it belongs to me not her. I'm a student and I stay around 500 km away from home and now when she cannot answer her cellphone I am stuck and cannot do anything even if it is urgent. When I explained this to your consultant she put me on hold for a good 10 minutes or so than she hang up the phone on me. Is my service not good enough for you guys that my problems don't matter. I could be dying here and wanted the service to call a friend to come pick me up and take me to the hospital but no the account holder who bought me this phone needs to be informed on everything I do on my phone. I am the one who is supporting your network on a daily basis not the account holder, I'm the one who in the end has to recommend your services to my friends not the account holder. I'm the one experiencing problems with my phone or your services not the account holder. I am so disappointed in the service that I received from Vodacom. It's really sad that you treat some of the people that support you the way you do. On the 14/04/2015 I bought at phone at Vodacom Rivonia. I pointed at the phone I wanted and then subsequent to that I was issued with a wrong phone which is Nokia Lumia 530. The explanation I got after my complaint when I asked for the correct phone "Is that once a box is opened there's nothing they can do" I then bought another phone and requested a refund. It is now 6x months of waiting. On Friday 30th October'15 I went back and requested a refund or the phone to be fixed. I was told by the customer service manager we'll call you tomorrow by the manager between 09h. No one bothered to call, I then decided to go back again and got to the shop at 12h. I was told the phone has been sent to head office,'we will call you on Monday morning. I am still waiting... I have had enough of these incompetent individuals at this shop. I am extremely upset, don't want anything to do with the Vodacom company. Please give me the phone back or my refund. It is enough now! Have been trying to cancel a router that I don't want have phoned. Sent 3 emails gone to Vodacom where was treated worse than anything I have ever experienced. A debit order was put through very promptly which I returned but of course they have managed to quickly let me know that I must go and pay that in despite my numerous attempts and emails that would make any person sit up and take note. But I have been totally ignored and treated with absolute disdain. My many years of being a customer and never missing a payment has come to nothing. So of course my contract is due for renewal and fortunately at least I will have a choice to move on, cant wait. I am paying for three data bundle contracts. Two of 2GB and one for 500MB. I am using this especially for e-mails that are work related. My balances are zero and when I enquired at a Vodacom shop they informed me that I am not getting data on any of these accounts since August, although I am paying the prescription amounts. They lodged a complaint and told me that it will take between 2 to 4 weeks for a response. My reference number is 53-9JY22-25vH7. This it totally unacceptable and I insist that me accounts be reinstated immediately and that I am refunded for the months I paid and did not receive any data. On the 27th August I booked in my almost 2yr old Sony Xperia Z1 with the following comments. A line in left upper corner of LCD, but LCD still functioning properly. Whites on pictures taken with camera hazy, possible lens is dirty/glass scratched. Speaker grill missing - fell out. Rubber seal on charging flap broken and missing. I was expecting a quote, but to my surprise, it was repaired in warranty. When I went to collect my phone, the camera issue and LCD was untouched. So I booked in it immediately again (job number 11026214) without taking possession of the phone. This time around my phone was assessed and deemed out of warranty due to physical damage. Upon querying the physical damage and out of warranty I was sent a picture of the corner of my phone and pointed to their Vodacom Website on Physical damage and warranties. I did not take possession of the phone but according to Vodacom they could not work on my phone as it had physical damage and I was quoted R3300. I complained and asked why the first repair was carried out and now quoted, all I got was a message to say it is under investigation. Then my phone was sent back without being repaired. Again I sent it back as I want to get to the bottom of this issue and this time my phone was deemed in warranty again and my battery replaced??? without any communication and sent back.. I have just phoned at 12.30 pm on the 16 October 2015, and the customer service person slammed the phone on me, when I asked him for the Customer Service Manager. He ask if he could help, I told him that this my third call therefore I would like to speak to a Manager who is in charge of the customer service people. I am really disappointed in the service but I have been with Altech AutoPage of rover 30 years, this this is the service I get. I need this guy disciplined and an apology. All I am query is that I received my phone last week, and now it’s a week and I am still not on the network. I phone through and did the sim swap twice now with two customer service consultant. If, I am still now on the new by Monday morning, please collect the phone from where you have deliver and cancel my contract, I will go to Cell C or Vodacom. On my latest statement I noticed that I am being charged for two handsets. I recently received an upgrade and am quite prepared to pay the amount of R380 for the new handset, but the old handset of R170.00 is also still being billed to me. On approaching the call centre with this I was advised that the old contract only expired in June 2016 and that I would have to pay for both handsets until then. The more I explained that the current contract had expired and that this was an upgrade, the more I was told that the current contract has not expired. I need someone to investigate and advise urgently. For about four years i had a contract through Real People Cellular. In December 2014 my contract comes to an end and i continue to use the applicable number on prepaid. Since Sunday 13 September 2015 it gives me a supplementary error. I phoned Real People and they referred me to Vodacom. I visit the Vodacom Golden Acre branch in Cape Town to Rica my simcard as it was barged according to Real People. Robin the person at Vodacom was very rude in helping me. He told me he can only help me if i do have the simcard number. He told me that the phone has been Stolen Lock (P) Full. He told me to phone Customer Care and so that they can unlocked the card, I've done that and they told me to go back to the shop so that they at the shop can Rica the simcard. Again the person that helped me said that the Sim has already been registered and it shows still Stolen Locked (P) Full. I phone Customer Care again and after quite a argue with one of the consultants there he finally understood my problem and referred me back to the shop. I told him that i will go back tomorrow with the necessary details and the Simcard so that we can put this problem to rest. I would like to inform you that I am extremely unhappy with Vodacom’s costumer service. I phoned in on the 20th of August to change my debit order date to the 1st of each month informed me that it has been done and confirmed that the next debit order will be on the 1st of September 2015. When I logged into my bank account I saw that my Vodacom debit order have not yet been paid. This is unacceptable as I arrange my finances according to the information provided by the Vodacom customer care service personnel. Now when I don’t have enough money in my account on the 15th I will get a bad credit record as the debit order will bounce all thanks to the Vodacom Customer Service personnel. This is not the 1st time received such bad service from Vodacom. (Data and airtime went missing. Had to phone in more than once to get that corrected) I have never had a pleasant experience with Vodacom. As soon as my contract is due for upgrade I will cancel both contracts and move to another service provider with better customer service and surly will never advise anyone to go to Vodacom. I wanted to migrate to Vodacom from Cell C I went to Vodacom and was assisted by the Manager Kate who told me I have to cancel my Cell C want a month and then hand in relevant documents to her for the migration the expiry date for Cell C was 28 August 2015 a week before I took all documents to Kate and she promised to get it all ready and to call if she needed anything else as I only wanted a sim card contract and the contract Kate suggested was Smart 5 for R209-00 a month. I wanted to put it through my company and handed all relevant documents to her. September 05, 2015 I went in to Vodacom as she did not contact me. I was then told that the company registration as incorrect!!! The company has been going since 1985 has bank accounts etc with good income and I don't think the R209-00 per month. I filled out another form and after confirming that it is the right registration no Kate told me be buy a sim card for R105-00 and it will be activated within 24 hr - it was not! I have contacted her how many time. She first told me the IT dept. was working on in & when I contact her today she sent me a message " Its declined"! Without an explination How is it possible. I upgraded my daughter to a Z3 about 3 months ago. Because it does not come with BIS, I was told i could apply for the BB10, which i did and the money gets deducted from airtime each month although she has never been able to use it. I have been to Parow Centre Store on 3 occasions and this has not been sorted. She received a message from Vodacom last Friday tom say the problem had been sorted, and it seemed it was, only up until the next day and then her BBM was off again. Please can someone contact me urgently as i need this to be sorted out once and for all. This is costing me a lot of money in data, not to mention the money for the bb10 is been deducted each month. I upgraded on 8 May and was told by Aaron from Vodacom Horison that my phone will be delivered on Tuesday 12 May. It did not happen until I phoned and phoned and they became rather annoyed with me. My blackberry passport was eventually delivered on 18 May. Which I reported faulty the very next day as it gives me an error message and would not pass that message. I was told by Aaron that someone will pick the phone up from me and they will sort it and have it back to me in two days. This is now day 4, still waiting for them to pick up the phone...I am so disgusted in the service I am getting I can pull my hair out, and just because there's no Vodacom employee to bash in the face. Besides having to sit with this very expensive phone in the office the whole week, my bill for the month has already been amended on the 10th of May already. That's even before the phone was delivered. And by the rate the service is going now, I bet they will charge me before this phone is back in my hands. With all this being said, I PRAY I GET A BETTER RESPONSE FROM THE ONE ON HELLO PETER !!!!! Last week, on Monday, I went to the Vodacom store in Pretoria Sunnyside to apply for a contract phone. The consultant there said I must submit my latest payslip, bank statement, and ID copy of which I did. Since I have two employers, I submitted my second payslip, bank statement from another bank I bank with just to increase my chances of getting the contract, then the consultant made me fill in the second application form similar to the one I filled in the first time I came. That confused me as I couldn't understand why. This week Tuesday, I went there (Vodacom store) to ask about the progress of my application then the consultant there said to me the system rejected my application cause there is fraud. I then asked him "are you saying there is something fraudulent about my documents or something?" Then he said "No your documents are OK we don't understand what's wrong." I insisted on getting clarity. They couldn't help me, he just gave me the Vodacom customer care line (082 111) which didn't help me at all. All they did was to transfer my call from one person to another until I got to the Online Sales Department where they advised me to go to the branch and ask them to cancel the application from the system so that he can process it online. I went there and asked them to cancel the application as I was advised by the Online sales Department. They gave me my documents back, and I called the online sales to apply for new contract phone afresh but the lady there couldn't help at all she just hang up the phone. CAN SOMEONE PLEASE HELP AS WE ARE TREATED BAD AS CUSTOMERS, THE LEVEL OF SERVICE WE RECEIVE IS REALLY BAD, CAN SOMEONE PLEASE FOLLOW UP ON THE MATTER AND HELP!! My son's almost new Sony Xperia's screen stopped working in the middle of March. The phone still worked, but the display was dead. He walked down to Strand Square Vodacom to explain the problem as we saw on the internet that it was a much discussed problem on certain batches of the Xperia. He was told by the staff that he had to take the phone to the repair centre at Somerset Mall (The Circle @ 5 Flags Centre). As I work out of town and my son doesn't have transport, he had to wait a few days before we could do this. We took the phone there on about 20 or 21 March. Unfortunately he dropped the phone on the way to the shop and it had a small crack on the back plate by the time we got to the shop. I understand that Sony refuses any warranty repairs if there is any damage on the phone. I accepted this reluctantly, and asked them to supply us with a quote. On 26 March 2015, I received a phone call from Stacey-Lee Manuel with the quote for the repairs and asked her to email it to me, which she did. I told her to give me a little time as it was a lot of money and I needed to arrange for the funds to be available. On 31 March 2015 at 12h57 PM I sent an email to vodacomrepairs.somersetwest@vodacom.co.za to confirm that they should continue with the repairs as I have the money available. About a week later, we saw on the Vodacom website that the phone was back at the Repair Centre in Somerset West. When we arrived at the Repair Centre we went to the counter to collect the phone. They went to collect it and to our surprise the phone was not repaired at all. When I asked them why it was not repaired, they informed me that it was sent back to them from the 3rd party as the quote was never accepted. I insisted that I accepted the quote and at first it seemed like the staff member didn't believe me as it clearly states on the document that the quote went unanswered. At this point I really lost my cool and insisted that the situation get sorted out as soon as possible. Eventually she apologized and agreed to send the phone back to be repaired with a priority notice. I am not 100% sure of the dates, but after this last conversation the phone has been away for more than a month. The worst of this whole situation is that we have received no communication from Vodacom whatsoever. TOTAL SILENCE. According to the website, the phone is still at the 3rd party repairer (for more than a month). My son actually phoned the Repair Centre last week to enquire about the status of the phone and was told that it's still being repaired and they will contact the 3rd party and ask for priority service. In the meantime, I have spoken to some other repair centres and they all confirmed that it was at worst 1 days work to repair the stated problem according to the quote provided by Vodacom. The level of service my son received from Vodacom is appalling, and it seems that there is no urgency from there side whatsoever to help. Every time either of us have contacted them, it ended up with an apology from them and promises to have it sorted out as soon as possible. Of course, this would never happen and they never communicated any follow up news to us. Every time we had to contact them again, they never had the courtesy to phone, email or sms us once after the phone was sent away for the second time. With all of this happening, he still pays his account every month!! I have spent my whole life in the service and sales industry, and I have never experienced such bad service. The attitude of Vodacom's staff is so bad that it seems they really don't care about their customers. This experience with Vodacom will be spread far and wide and everyone who is willing to listen will hear this story. My phone gives problems, just going off. I took my phone to Vodacom Chats in Brakpan. The guy said it can only be a software update or battery. I just bought a new battery, I said to him I think it might be charging points as my phone does not charge. He did the software update for which I paid R180. When I went to fetch my phone the same problem exist. He then said I must buy new battery. I told him I have just bought a new battery. Now he wants to give me quote for repairing my phone which I think he should have done in the first place. This guy is just trying to make money out of customers. If I can't get this solved I will have no other choice as to contact the onbudsman. I hope to hear from you soon. My Daughter's, who works on cruise liners, cell phone was stolen while she was home in November 2013, and this was 2 days after taking out the contract. As a result, when my husband was due for an upgrade last year in May 2014 we got a Nokia Lumia 720 for her as her contract had 18 months to go. We tested it and then put it away until she returned from overseas in Mid July 2014. In August 2014 the phone's sound started coming and going. The phone was then taken into Tyger Valley Vodacare store and at the time told them that this was urgent as she was returning overseas on the 11 September. The updates and responses were very poor and we had to phone on a weekly basis to chase things up only to discover that the phone was sent to Johannesburg only a week before she was due to leave. I then had to phone on a daily basis and it was eventually sent back to the store 2 hours before she was due to leave for the airport. On her return, the phone was taken back to Tyger Valley Vodacare on the 23rd March 2015 and again told them that this was an urgent job as she was going back overseas. and here the fun began again. ...... the previous job had not been closed and as a result a job number could not be provided. This they said had to be done by head office. After 4 phone calls and going to the store 3 times this was eventually achieved on the 17th of April. Again after various calls I was eventually told today 4 May 2015 that the phone is on the way to Johannesburg and has not arrived yet. 17 days after the job was allocated and 42 days after the phone was handed in. My daughter is leaving on 11 May which is in 7 days time and no repair has even been started. This phone is still under Warranty, and I now demand a replacement as I do not trust that: number 1 it will be repaired correctly and number 2 continue to work once she leaves again and then at that stage the warranty will have expired. I ordered a Tablet and phone combo from Vodacom. The courier only delivered the phone. I was not too happy with that and I phoned Vodacom to ask them to collect the phone on the same day. I received the phone and canceled my contract as they have a 7 day exchange option, this was from November last year. Every time I phone them, they say that it takes 21 days to collect. It is now 6 months later and no one has collected this device! What irritates me even more is the fact that Vodacom have been taking money from my account every month. I find this very unprofessional from Vodacom. As one of South Africa's leading cellular networks, I expected them to have more moral and values and stop stealing and robbing its clients. Failing to get a response from Vodacom, I will be speaking to my lawyers to get back what was wrongfully stollen from me. My contract phone (Samsung S5 Mini) was stolen 2 months ago and I am struggling to claim my phone back because some genius never activated my insurance, which I signed for on my contract. So now for the last 2 months I have been paying for a phone I dont have, Vodacom please sort out your mess and fast. Why do you advertise on the internet under itemized billing that you can view you recharge history, recent nos. dialed, account mini statement, 30 day statement, etc etc. when you cannot deliver or have the options available. Vodacoms service is really becomming frustrating more especially when you advertise what you cannot deliver. I am seriously thinking of switching networks. Even your call center is a waste of customer time and money 99% of the time they tell you they are working on the problem day's on end. I took my phone for repairs on 11-04-2015 at Vodacom repair centre in Polokwane. The phone had a problem of a thick line on the left screen of the phone. The job number is 10736102 and they collected the phone on 23-04-2015 and the problem was fixed but they upgraded my phone with a new software which I don't like (not user friendly). I then went back to Vodacom repairs centre to ask them to reinstate the software which came with the phone, I was told that is not possible. I as a customer not happy with this software version 5.0.2. I know for a fact that it is possible as I have knowledge of this, so please my request is straight forward. Loss of business and destruction of existing infrastructure/property. The on going laying of fibre optic cable in ubungo has caused a total closure of my business for the last four days, sewage infra has been completely demolished, parking lot has been demolished and blocked. I am filling for legal assistance and you will be communicated shortly. My sim card for my data device was hacked in June 2014 and the data usage alone was R4,000. I was actually in the hospital during this time and Vodacom agreed to reverse the amount of R4,000. Vodacom confirmed that they could not find any sign of data usage on my service and also confirmed that this was indeed someone hacking in. Then, on the 1st of January 2015, an amount of approximately R6,500 was debited from my account and I immediately then reversed the debit order with my bank. I called Vodacom Customer Care immediately afterwards to inform them that I had reversed the debit order and my reason for doing so. This is when the 1st service request was logged and after 21 days it was closed without any feedback. Needless to say, I eventually landed up logging 4 different service requests and after 2months of ongoing calls to Vodacom I apparently owed R30,000 for data usage. I have been into a large Vodacom store and still have had no joy in getting to the bottom of this. All that I am told is that "the agreement states that you pay for data used no matter who uses it." Yet again, I am told that they cannot find any data usage in their records and they don't know the reason for the high billing. I am a 62 year old woman and nowhere in my wildest dreams would I use R30,000 worth of data. If I check back in my records, I seldom exceeded my monthly data usage and for me to spend such a large amount on data is purely impossible. I also received no notifications on any of my data devices that I had exceeded my monthly usage and anything stating that any further data usage would be for my own account. My data stats on both devices show that I’ve used 32 GB since 2012. Even my daughter has tried to rectify this matter but to no avail. I've been using my number for as long as I could remember, but recently, I needed to do a sim swap as I've got a new handset requiring micro sim. I went to a Vodashop at Festival Mall and was told my number is registered under someone else's name. I was asked to get an affidavit confirming it's my number which I did, and they faxed it for me. I was told it should take 48 hrs for it to be resolved. To date, it hasn't, and yesterday, I went back to the same Vodashop and the same consultant didn't have an answer for me. He just to re-fax it all over again and asked me to give it another 48 hrs. I asked as to where the division dealing with the affidavit is located for me to go there personally to get this sorted but was told they don't deal with customers and have to liaison with them instead. What do I need to do as this number is mine and is actively in use? I did apply for a business contract from vodacom on Tuesday 14 April 2015 via online services, on Wednesday Vodacom phoned me and my contract was approved, they also send me a mail to say the contract was approved. On Thursday a Lady called me and confirm my package and also on mail again. She inform me someone will call me for telephonic confirmation on Thursday the 16th April, the the phone will be delivered via courier on Friday. On Monday the 20th of April I phoned 0821945 and they put me through to 15 different people where I have to tell them the same story over and over, eventually I got to the right division. They promise me early during the morning somebody will phone me on Monday, to confirm whatever they need to know before they send out my cell. So I phoned again 3 times during Tuesday because I have to give training and cant take my cellphone with me, and get the same promise over and over, somebody will call me immediately, they have send emails to the "CONFIRMING" definition. I lost 2 days at work. A lady was very rude to me yesterday, but that was the same lady that told me lies about phoning me back. I overspend my calls to vodacom and it is now furious because they cant do their jobs and made false promises to the customers. If you phoned 0821945 it sound like a lot of bees they laugh and speak loud, why are the in a position if they can not act professional. The first month that I got my account they overcharge me with the minutes (they don't give me any minutes) I pay for the more expensive contact and I don't get the benefits. so I called Vodacom and they will take care off it. I stopped my debit order and pay them the wright amount of money that is dew to them. The second month came and the same story, only they charge me R100 because I stopped my debit order and the money I deducted from the bill the previous month a nice bill, very close to R3000.00. I phoned them again and they say they will sort it out and pay me back my money that I was overcharged, even give me reference numbers. I have been using a Samsung Note 3 over the past years and got stolen recently. I need an Android Phone as I am an Auto Electrician and do diagnostics with a Bluetooth diagnostic device to allocate faults as well as an independent business with a print out report. After this phone got stolen I took out another contract as I needed an Android phone urgently. The phone I took was a Sony Z3 as it was advertised as waterproof that you can take photos while swimming and thought it may be an extra feature when swimming with kids. A month later my son spilled coffee on the phone and I thought it is water proof, I can clean it with water. I did dip it in water and dried it with a cloth. After that the phone was working but speakers did not work. I handed it in with this complaint on the 25 March 2015 in Vodacom Brits Mall(JOB NO.10702495). I had this phone one month Only. I received messages that it has gone to Four ways mall, then advance repair center, then again four ways mall and again to advance repair center etc. This phone seems to have a problem from beginning or it was falsely advertised, never the less it costed me a loss of clients as I can not help them. I beg of you not to send back that phone. I fear I may endure further problems and loose more clients. Notice of price increase received on all my contracts from 1 May 2015. I do not accept the increase as for point 5.8 of the contract, and the vodacom increase, to my contract prices, and the fact that Vodacom is cancelling our two year agreement/contracts from their side. I do accept the right of Vodacom to increase their prices as per 5.8 of the contract, and I therefore exercise my right to agree to terminate, not cancel from my side, our contract, with all the costs/charges/exspences to Vodacom as from 1 May 2015, on all my accounts. My right to keep my sets/ phones/numbers and to make all numbers, prepaid accounts as from 1 May 2015 and that no instrument will be blocked or blacklisted. Vodacom used to be a wonderful network, however it has gone extremeley useless. I recharged with a R12.00 vodacom this morning and I hardley used my phone. At half past 10, I tried to send a message only to find out that my balance was R0.00. Many times this had occured and when I called in they couldnt explain why. In one case, the lady said that vodacom was experiencing problems and that the airtime would be restored shortly which never happened! R12.00 is alot of money and what should one do when they are in an emergency? I expect an email back from somebody in vodacom, acknowledging my complaint! My complaint is as follows:- I purchased a handset (Samsung S5660 G10) from Vodacom in July 2011. It was delivered to me on 27 July 2011. The contract ended in July 2013. I was contacted via telephone advising me that I am due for an update, I advised the lady that I am not interested as I already applied for a contract with another service provider. The amount deducted via debit order from my savings account with Absa was R185.00. This debit order never stopped, in January 2014 the amount went up to R529.00 without my approval. This amount are still being deducted from my account. After several phone calls (referring me from one number to another, to no avail) and several e mails I still had no reply. The account number for the above purchase was 12759433. My vodacom account is still not reactivated, I have on numerous occasions attempted to speak to your consultants, who requested proof of payment. I have emailed them repeatedly everytime I spoke to a consultant. My debit order to you has been successful every month and its now 4 months and my number is still not activated. Please can you assist me urgently. I am so tired of speaking to your incompetent consultants who unfortunately cannot assist me. I want to lay a official complaint this morning against Vodacom as well as a certain Leroy at the Bay side Vodacom walk in store in Bloubergstrand. Apparently he is the Branch manager at this store. I am a long life customer of Vodacom and if you go into my history, you will find me with your company for many years and i was always receiving the best service yet.However, i am very disappointed with the service i received from your walk in shop in the Bayside centre in Bloubergstrand. I do have a ADSl line with Telkom and was using it to do my work with the Bank who i am contracted with. All my administrative work was done on the Bank's system and ADSl was working just fine for me in the area. Last week i experienced problems with my ADSl line and my computer and my husband that's always dealing with this, was not at home. I panicked and ran down to the Bay side centre to obtain help from your local walk in store on the 02nd April 2015. I did sign a contract and a package was handed over to me in the form of a Internet stick and a Sim card. The salesman wanted to open it for me and i requested him not to do so because i know what it is all about. i did have this same product before. I left and because the next day was the start of the long weekend, i didn't open the product neither connecting it with my computer. My husband arrived back on Saturday the 4th April 2015 and fixed the problem for me. it was just a setting according to Telkom. My son and husband re minded me that i can still go and cancel the product because the NCA specifically allow a period for a "cooling of" on any contact. i am a Bond Specialist as well and was aware of this legal point. I went back to this walk in store on the 6th April 2015 and requested the salesman to cancel the contract. He said to me he can't do it because it is a walk in deal. If it was done telephonic, it was differently. My husband ask him what the difference was. He then turn around and said he will call his Manager. A unknown person approached us and he identify himself as 'Leroy" He confirm the statement of his salesman and said the contract is binding for 2 years and there is no way the contract will be cancelled. husband informed him that we will lay a complaint against him at the Credit Regulator. He invited us to proceed. We left the store. I then contacted Vodacom help line on the 6th April 2015 at 15H50. I spoke to a certain Fatima. I informed her the reason of my call and i ask her if this call are busy getting recorded. She confirmed it. I cant believe that a big company as Vodacom are, will commit such a atrocity against a Law of the Republic of South Africa,. A further disturbing point is as i understood Fatima, that this product was not even activated on the 6th April 2015 although it was already taken on the 2nd April.Leroy still have the audacity to tell me that there is nothing i can do. In December 2014 I have upgradesd on my contracts, I had to pay another 3 months on my previous contract R79 extra with the new contracts amount. I chose my new contracts on the U choose Flexi 100. Now in March when it came to the last payment of my previous contract Vodacom chooses for me that we should now be on U choos flexi 110, making me pay R10 more on each contract without giving me a call and asking if it is ok to put my airtime up with R10, I was never informed that I had to pay R10 more when I went for an upgrade. How could choices be made without consulting a client? I am not Happy with this because no one informed me about this I only got a sms saying From 1 May 2015 your uChoose Flexi 100 subscription will increase from R99.00 to R110.00 per month. Your new price plan name is uChoose Flexi 110, you are quick to give a call and try to sell something new to your clients. But when it comes to sticking to what a client asked for in the first place I don't know. I had been incorrectly billed on my account, I realized in July 2014 that I had been paying exorbitant amount for this number. I stopped using the number and kept the Sim card where nobody could find it. To my surprise on the 6th December 2014 when I checked my bank statement I found out that Vodacom had been deducting the same amount (about R 911.45 or so) for all this months for the number that it is not in use. Despite contacting Vodacom to rectify the situation they had continued to deduct this amount until end of January. Their explanation of deducting such exorbitant amount was because I subscribed for Virus protection with a certain company of which I had never subscribed for such service neither did I give anyone consent to deduct my money through Vodacom. The money that was deducted was unreasonable for Virus protection. This is completely unacceptable situation and I would like Vodacom to reimburse all the money they have deducted for this data service with interest. I must mention that Vodacom customer service is really poor. I am willing to provide my bank statement and invoices, if required.